Preheat oven to 180 degree celcius. Line two baking sheets with parchment paper/ baking paper. In a bowl, whisk together the plain flour, baking soda and salt. Beat the butter and sugars in a large bowl until light and fluffy for about 2-3 minutes. Add egg and egg yolk and beat well. Beat in the vanilla essence. Gradually add the flour mixture to the creamed mixture and beat just until incorporated. (If batter is soft, cover and refrigerate for 30-60 minutes or until firm). Using an ice cream scoop or two spoons, form batter into balls and place 6-7 of them in each baking sheet. Gently flatten each ball into round shape. 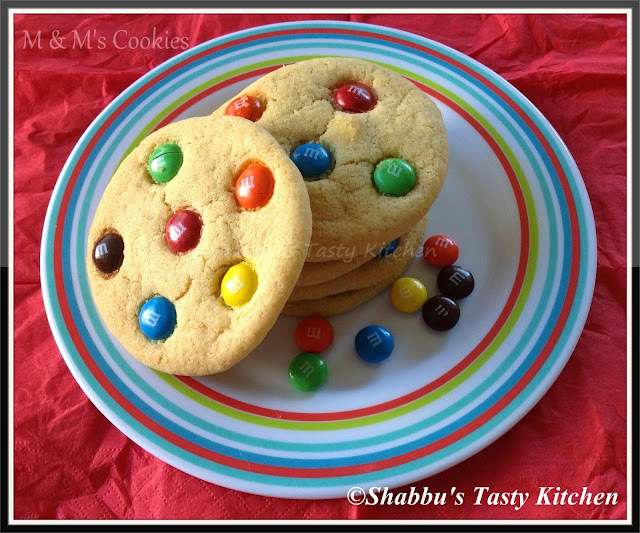 Place the M&M's candies on top of the cookies and gently press the candies. too cute, Shabbu..and very tempting to kids..
cuties ! any kid would love them or sure !